Irvin Khoza, assistant resident engineer on the project says the road is being built to help transport material for the building of the N2 Msikaba bridge. The estimated value for the project is R29m (ex VAT), 30% of which has been allocated to SMMEs. There are no joint ventures appointed on the project which started in October 2016. “This is the first phase of the project. The second phase will be the actual N2 that’s going to be running across next to what we have now which is the haul road,” says Khoza. The road features a 140mm depth of concrete pavement. “With this concrete pavement you’ve got panels that are different. You’ve got what we call anchor panels. With these panels in this area I would say instead of having your normal C4, you’d have that as a trench that’s been opened, so the concrete can go deeper. This is so it can be that anchor for the road so that it can hold on to the other to bond with the road itself. Underneath you’ve got mesh steel reinforcement. We’ve also installed guardrails for safety purposes,” Khoza explains the specifics of the road. The end of the first phase completed at the end of March 2018. He says they have managed to work hand in hand with the local SMMEs and offer them guidance on how to help their businesses to succeed. 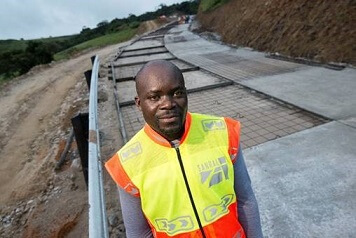 Emmanuel Sisanda’s company First Building Construction has helped to create much needed jobs in the Msikaba area where they are contracted to help build a haul road for the construction of the N2 highway. Before being contracted on the project, he worked in the construction sector building schools and other public amenities. He was sub-contracted on the Msikaba North haul road project by Grinaker. The company’s responsibility includes building a concrete pavement and steel fixing. They also supply the concrete used on the project. “On this project I have 17 labourers drawn from the local community,” says Sisanda. “There is a lot that we are looking forward to. We have always wanted to be a growing company. 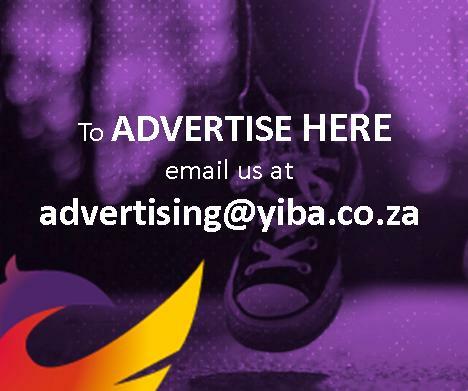 Working for SANRAL is a good opportunity for getting exposure and people will know about us through the work we do here. “We would like to say thank you to SANRAL for what you are doing for us because even as individuals we are benefitting from this project. The community is also benefitting from this so, thank you SANRAL,” he says.